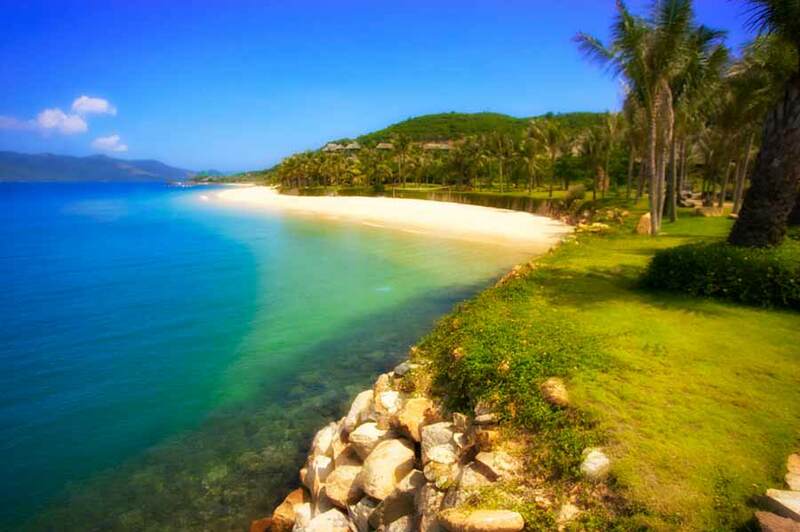 Ninh Thuan - Most Beautiful Hidden Province in Vietnam? Ninh Thuan Province is the newest province in Vietnam. It was split away from Binh Thuan in the South and Khanh Hoa in the North back in 1993. People finishing their geography classes before that time may not even be aware the province exists. Being the personal private beach for the last President of South Vietnam didn’t exactly help it gain publicity or early popularity. The nearest airport is Cam Ranh International Airport, better known as Nha Trang Airport despite the fact it sits nearly halfway in between the two provincial capitals. Less understandably, the local train station where nearly all North/South trains stop, is called Thap Cham Station. Thap Cham is the historical capital of the Cham people but it has been swallowed up by the city of Phan Rang. The main beach – called Ninh Chu Bay, Ninh Chu Beach and Binh Son Beach – falls just outside of Phan Rang’s jurisdiction. Seven resorts offer two to three star rooms, but even these businesses add to the confusion; the largest resort is called Saigon-Ninh Chu Hotel and the second largest is named after a pottery village 30 km to the south. Phan Rang, the capital of Ninh Thuan, has an identity problem. Or more accurately, it has a lack of identity problem. The city is located exactly in the middle of the tourism triangle formed by Phan Thiet, Dalat and Nha Trang. 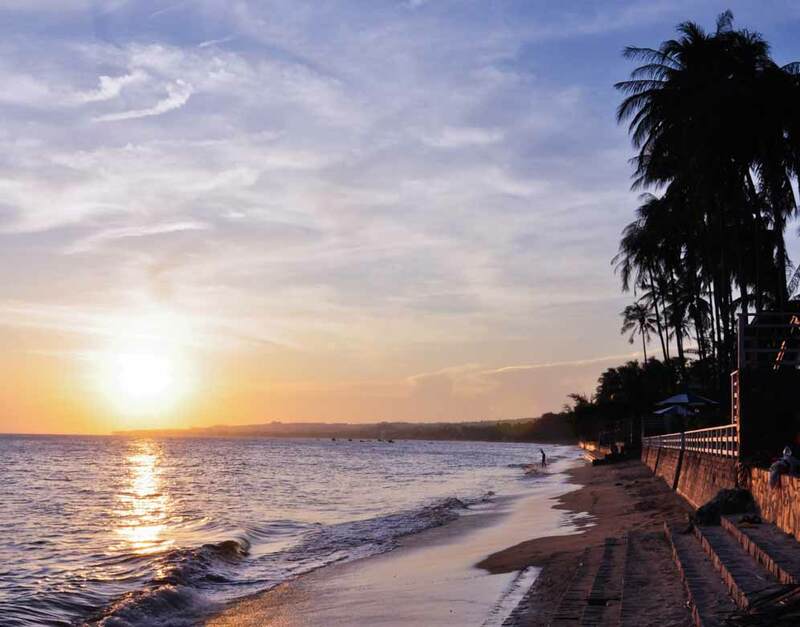 But it might surprise you that in 2014, twice as many tourists and foreign tourists visited it compared with the much better-known destination of Phu Quoc. Most people are also surprised to find out that the coastal city of Phan Rang has a larger population than Phan Thiet. So why is Phan Rang’s tourism less established than its neighbors? The resorts’ complete indifference to marketing is the biggest problem in building awareness. The locally-owned resorts don’t care about individual travelers or foreigners; they make money working with tour groups and those wonderful corporate team building trips that every company seems to have during the summer. Not a single one of them uses advertising, and none seem to care much that Tripadvisor does not even list Ninh Thuan as a province. The aforementioned Saigon-Ninh Chu Hotel’s listing is in the Mekong Delta! Currently, the only internationally managed resort is located 30 km north, in Vinh Hy Bay: the Amano’i operated by the prestigious Aman Group. Unbeknownst to most, Amano’i’s customers are extremely rich and famous and the resort prefers not to be noticed by the unrich and unfamous. For example, did you know it is possible to take a private Gulfstream jet from Thailand to Cam Ranh (at a price of $58,888), be picked up in a luxury SUV at the airport and delivered to your $8,000 per night room overlooking beautiful Vinh Hy Bay? You might be surprised to know that the tourism center of the province is faster to reach by airplane, train and bus than most of Nha Trang. The Cam Ranh International Airport rests nearly in the middle of Phan Rang and Nha Trang. By rail, the Thap Cham station is positioned 10 km from the beach and nearly all the trains stop at the station. The resorts are a five minute drive off Highway 1A. Ninh Thuan’s northern coast is one of the very few locations in Southeast Asia that qualifies as a Mediterranean climate; meaning fairly moderate year-round warm temperatures, low humidity and dry. It has the least amount of rain in Vietnam. Dalat wines are made with Ninh Thuan grapes and places with the climate to grow grapes are also among the top tourism destinations in the world. While inland Ninh Thuan is hot, Phan Rang’s average high temperatures during the summer are less than Ho Chi Minh City’s, Hanoi’s and Danang’s. It doesn’t hurt having a cooling wind every day, either. While this is true, it is because of the low level of urbanization. With only one city of any significant size, most of the population works on farms or fishing. Phan Rang is actually quite affluent (as many provincial capitals are) and the province has been receiving significant money for infrastructure from Hanoi. The roads near the beach are very wide and public utilities are reliable and meet demand. More businesses are investing in Phan Rang each year (a huge Maximart just opened). Now that you know why you have not visited, it is time to explain why you seriously need to see this place. After the new coastal road opened, adventurous kite surfers from Mui Ne immediately traveled up the coast and discovered several world-class kite surfing spots free of congestion. The wind blows all year and the conditions are so good that it is rumored the Kiteboarding Tour Asia (KTA) will hold an international competition at Ninh Chu Bay next year. Moreover, the northern coastline has perhaps the best waves for surfing in Vietnam and sailboats are beginning to be spotted in Vinh Hy Bay. For those who like their sports on dry land, the area around Phan Rang offers up plenty of adventure. A small resort is being developed near the Mui Dinh sand dunes and will be hosting off-road vehicle adventures. Looking up into the hills and rock formations, it is easy to imagine a cottage industry of hiking, mountain biking and rock climbing. Trekking tours through the Nui Chua mountain range can already be joined, and the area has great potential for river rafting. Those looking for more passive diversions will enjoy the spectacular sightseeing. Most of the coast of Ninh Thuan province has never been accessible up until now. A new 116 km coastal road was just completed that begins in Cana, passes through the sand dunes of Mui Dinh, along Ninh Chu Bay, past Vinh Hy Bay, and cuts back inland after Binh Tien beach to reconnect with Highway 1A just south of Cam Ranh. With the coast being isolated up to now and much of the route inside the Nui Chua National Forest, dozens of undeveloped beaches line the road and you can stop and enjoy your own paradise. Better hurry, it won’t be long before it’s developed. Like most provinces, Ninh Thuan has its fair share of religious sites – both old and new. Po Klang Garai is a 700 year-old Cham Temple that is still in use (go in October to witness the Kate Festival) and well maintained. Plenty of parking, nice gift shops and easy access from the train station or Highway 1A helps make this a better excursion than most Cham temples in Vietnam. For a truly unique experience, make your way up to the top of the Truc Lam Tinh Vien temple complex located on a hill behind the center of Ninh Chu Bay. A 10 minute hike (carry some bricks up if you need good karma) will result in amazing views of the area. Don’t stop at the large temple, pathways behind it lead to the twin summits. At that point you will have an unforgettable 360 degree vista of rice fields, Ninh Chu Bay, and the Central Highlands. Witnessing the sunrise or sunset from the top of the hill is unforgettable. 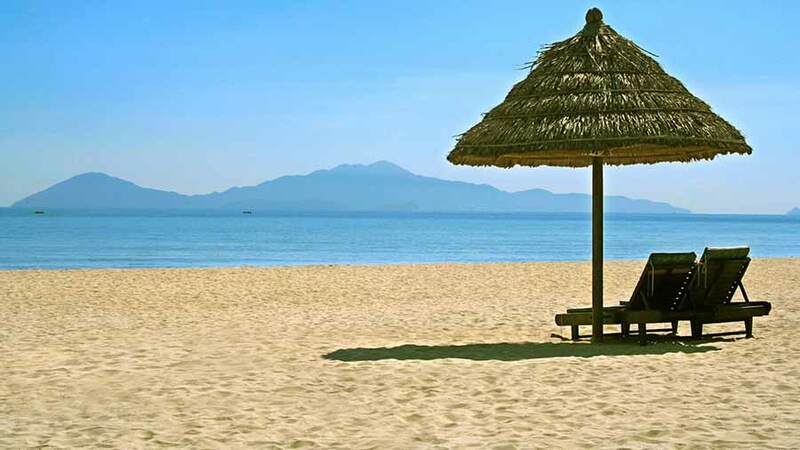 The most obvious reason to travel to Phan Rang is the beach. 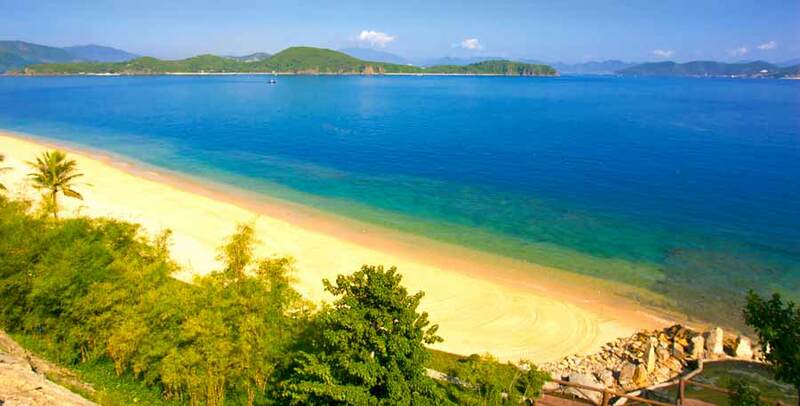 Ninh Chu Bay, a splendid 10 km crescent, is considered one of Vietnam’s nine most beautiful beaches. It is safe to swim most times of the year and during the daytime it is nearly deserted. Sunrises are spectacular and it is quite enjoyable to come out and watch the locals go through morning exercises. Most of the resorts lack nice beach facilities and thousands of Vietnamese come out from nowhere in the late afternoons, so the best spot to go is a couple kilometers across the bay to Ninh Chu Bay Beach Club & Bar where they have a private beach, cabanas, beach chairs and good Western food and drinks. Phan Rang is different because it is so normal. It is not some undiscovered primitive spot – ATMs, metered taxis, high speed internet are readily available. But neither is it full of the bars, massage parlors and typical touristy trappings found in more popular locations. The expats who make their way to Ninh Chu Bay almost unanimously say that it will be the next “big thing” in coastal tourism for Vietnam, but development has been slow. Being late to the party may turn into the area’s greatest strength, however. Learning from other locations’ mistakes and developing the tourism infrastructure before the tourists arrive may give the province a long-term advantage over its neighbors. Those of us who live in Phan Rang love it but we see change coming. It will be a struggle to keep the uniqueness of the area while more resort projects begin opening along the coast. The plan from both the government and many of the developers is to leverage the wonderful characteristics of the area and promote what I have termed third generation tourism in the province. Likely the focus will be on adventure travel and wind sports along with smaller resorts focusing on niche markets – such as the Amano’i. But still, if you want to see easily accessible yet unspoiled beautiful coastline, now is the time to go. 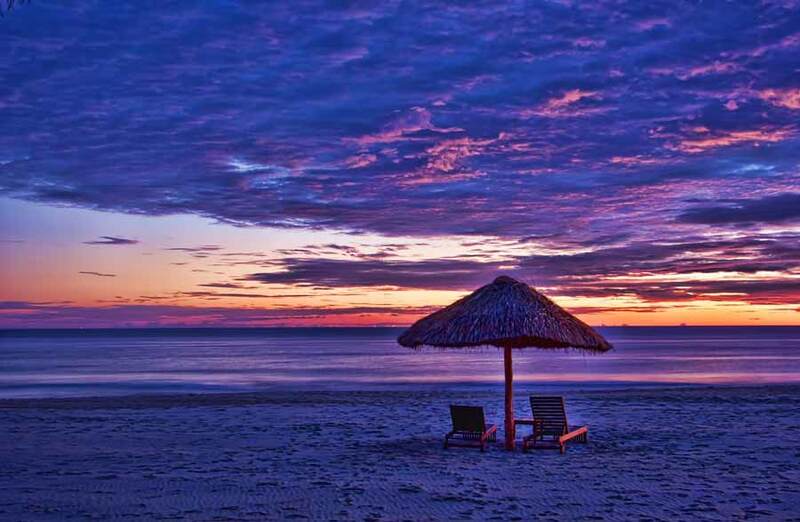 The beauty and tranquility of the beaches in Vietnam is one of Asia's best kept secrets. 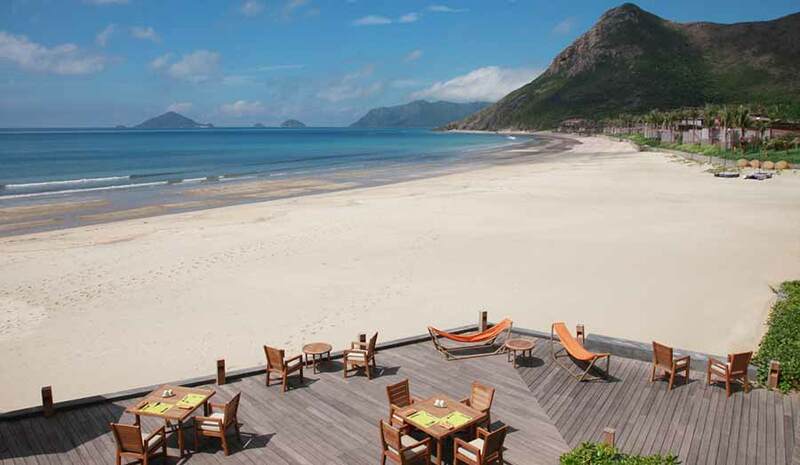 Green-blanketed mountains run down to a pristine stretch of white sand at Sandy Beach - Danang. An idyllic place to relax, and just an hour’s flight from either Saigon or Hanoi. And what about that view? The charmingly rustic Hoi An Old Town is one of Vietnam’s most popular destinations, but just a few kilometres out of town are some of the country’s best beaches. 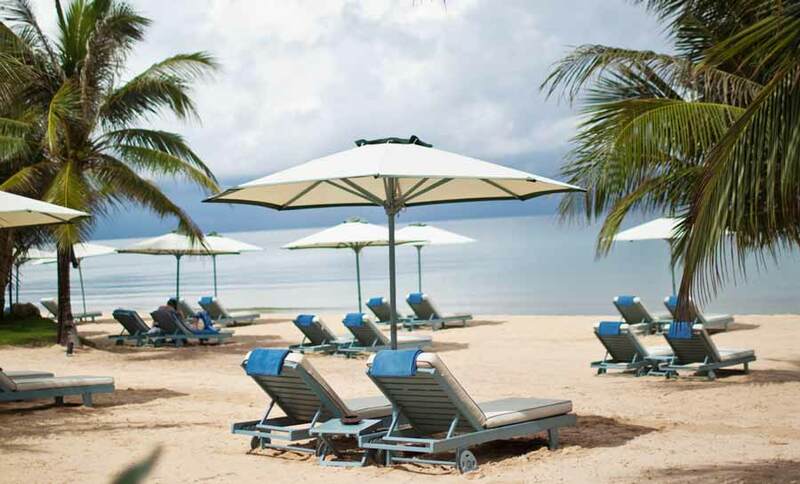 Rent bicycles and ride out to Cua Dai beach, grab one of the sun loungers and wile away the hours. 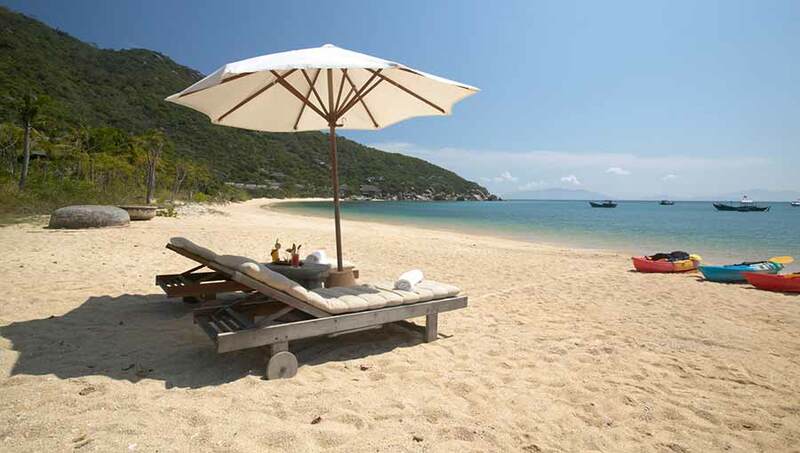 Think we missed out an essential stop for a blissful beach vacation in Vietnam? Make sure to let us know – we’d love to check it out!